THE REVIEW: Usually I’m a fan of long epics that have drawn-out world- and character-building scenes, especially of the James Cameron variety (see: Titanic and Avatar). Going into The Abyss I hoped the same would ring true with it’s 146 minute runtime. Unfortunately, quite the opposite occurred: I was extremely bored, and felt the film going nowhere even during high-octane action scenes involving the mysterious underwater alien species. The premise is quite promising and intriguing. Limited locations (underwater base and submarine) and a search for the unknown (what caused the nuclear submarine to crash) are both prime for entertaining filmmaking. Many of my favorite films are ones that self-impose limitations (Panic Room is just one such example). And while that certainly sets the stage for exciting things to come in The Abyss, it ultimately falls flat due to several problems along the way. One of the biggest problems with The Abyss is the so-called NAVY SEALs that the civilians (who are untrained in nuclear submarine search and rescues) are supposed to help. Nothing, absolutely nothing, about the military characters comes across as disciplined or authentic. Instead, Lt. Coffey (Michael Biehn) and his men look like a ragtag bunch of braindead, untrained militia that blindly follow orders which put the entire operation in jeopardy (thanks to an incoming hurricane named Fred). Even the civilians, led by Bud Brigman (Ed Harris) come across as more organized and competent, which shouldn’t be the case when in the presence of highly-skilled NAVY SEALs. By the end, when Lt. Coffey starts going paranoid and batshit crazy, it is no longer amusing nor interesting; it is merely poor execution of an already bad idea. You might argue that it’s an important part of the story and what drives the conflict. True, however it only hurts the film overall. Create a different source of conflict so you don’t need derpy, unrealistic characters and scenarios to drive the film. Two other complaints I have about The Abyss deal with the politics and dialogue. The politics portion deals with the clearly anti-Russian and anti-Communist agenda. 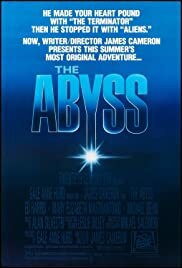 The Abyss certainly isn’t the first film to cover the topic, and isn’t even the first submarine-based movie to cover the topic. But involving a Cold War-era, anti-Communist perspective is completely unnecessary and distracting in the film. Not only was the Cold War already coming to a close when The Abyss was released in 1989, but politics shouldn’t be the main focus of the film anyway. The underwater, search and rescue, and survival elements all trump that in terms of potential entertainment, and diverting attention to a mostly unnecessary and half-formed political message hurt the overall film. Dialogue, an area that’s never been one of James Cameron’s strong suits, is particularly bad in The Abyss. A lot of interactions feel jarring, forced, and unauthentic. Bud’s signature catchphrase, “Hold on to your pantyhose” serves as a great example of just the kind of quality you get from James Cameron’s writing. When you cringe at every other scene because of the kind of garbage which comes out of characters’ mouths (not really cringing, more like shaking-your head), it’s a problem and further distracts you from the good elements of the film. THE TAKEAWAY: In the end, I chalk The Abyss up to a missed opportunity. Perhaps my high expectations being a James Cameron fan coming into the film hurt my viewing experience, but I think it’s more about Cameron trying to bite off more than he could chew. Certain moments in the film are still interesting and can get your adrenaline pumping, but for the vast majority of the film you’ll be sitting in your seat trying to keep your eyelids open.